The conceptual Generic Management Model for large datasets provides a means of satisfying the highlighted five issues and then provides an Information Universe Model foundation for developing domain specific applications upon that extend traditional 2D/3D representations of space through the incorporation of an additional spatial dimension. In order to conceptualise the underlying data structure and data linking it was necessary to use techniques which were inspired from geometry and which map spatial dimensions in 4D onto stereographic geometric object representations in 3D. This facilitated the interaction of the underlying data objects which mirrored the data dimensionality. This differs from present day approaches since the user interface is firmly coupled with the data repositories through the Information Universe Model. 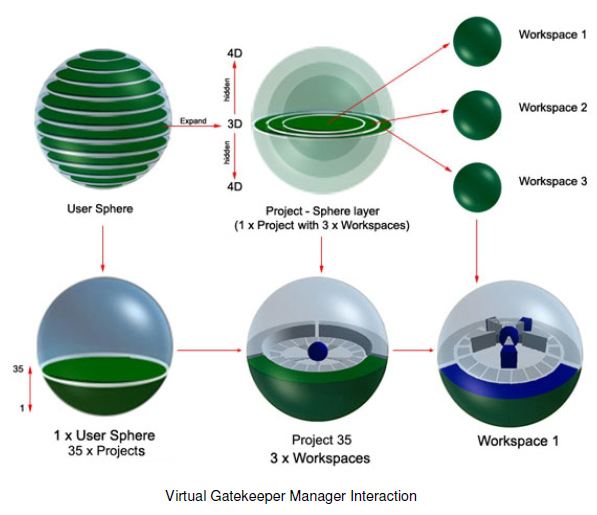 This Information Universe approach gives the foundation for developing domain specific applications such as Virtual Gatekeeper. It does not however, define the design of the User interface in any way. 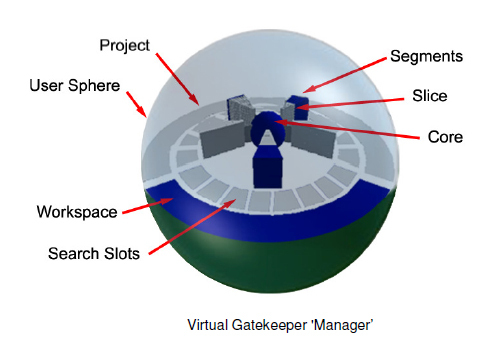 Virtual Gatekeeper (VG) was constructed as a means of demonstrating the implementation of the GMM model. All categories are visible with the addition of a central core which records use of the system linking into the database. In addition, search slots are shown; these record the results of searches made by the knowledge worker and recorded by the system. It should be noted that the conceptual model is based around the Workspace which consists of a number of search slots that are tied to it. Each labelled search slot would represent a single search that is useful for the category in which the knowledge worker resides. In this way a search (semantic or hyper-semantic) covers all lower categories that are based either on the local system of the knowledge worker and unique to their session, or search across all lower categories associated with the category which they are in.